It wasn't until the train went past that she saw the small body lying in the long grass by the side of the wood. 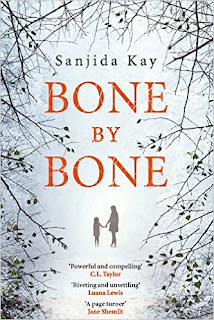 The opening sentence of the prologue of Bone by Bone by Sanjida Kay prepares the reader for a gruesome read and from the text a suspiscion that a child has been murdered. When Autumn had first started at Ashley Grove in September, Laura had been as nervous as her daughter. She’d been worried about Autumn – if she’d make new friends, if she’d fit in – as well as for herself – would the other mothers like her? Laura is making a fresh start. Newly divorced and relocated to Bristol, she is carving a new life for her and her nine-year-old daughter, Autumn. But things aren't going as well as she hoped. Autumn is being bullied. ‘Autumn. What kind of dumb name is that? Who’d call their kid that? It’s like say, “Hey, November, come in for your tea.”’ …As he continued, calling her more random and ridiculous names, the boys in her own class started to laugh too, and some of the girls put their hands over their mouths and smirked. The action takes place over seven months from October to May. The perspective alternates between Laura and Autumn. Not only does this give the reader an insight into how a mother might deal with a bullying situation or not as in this instance, but also the child perspective. This is a clever device for a book about bullying as it not only illustrates the mother’s worry and powerlessness, but also the vulnerability of being a child who is bullied. A vulnerability created by not wanting to make a fuss, by hoping that the bullying will stop, by believing in the good of people in general. When the bullying doesn't stop, Laura makes a mistake with dreadful consequences. Autumn fails to return home from school one day and Laura goes looking for her and happens upon a crowd of bullies taunting her little girl. Rage overcomes Laura and spills into violence. Something inside her snapped. She wanted to kill him. He was so close to her that it only took a shift in her weight,a slight movement forwards and she was right there, her hands on his chest, and then she pushed, as hard as she could. In the heat of the moment, Laura makes a terrible mistake. A mistake that will have devastating consequences for her and her daughter. But Laura can not anticipate just what those consequences will be, and just how much worse things can become. Friendships begin to unravel, leaving Laura and Autumn even more isolated and lonely. In an age where many people have a lot of personal information online, Sanjida gives an insight into the power of the Internet when used for benign purposes and just how easy it is to sabotage a victim's life. The cyber bullying tactics that spill over into real life, are very topical and will resonate with a lot of parents today. Autumn was acutely aware of the space that had opened up around her. She was alone. no one spoke to her. it was difficult to breathe. She stared down at her shoes on the cracked Tarmac of the playground, a tree root visible beneath the asphalt. There is an underlying sense of unease throughout the novel as the reader waits for the anticipated murder. As Laura and Autumn struggle with incident after incident, the inaction of the school, of the bully, of his father and of the other parents, the narrative builds and builds to an unexpected climax. Bullying is horribly common: the NSPCC says that almost half of all children are bullied. Three-quarters of those bullied were physically attacked and 62 per cent were cyber-bullied in 2015 according to a report carried out forDitch the Label. Nearly half of those children who were bullied, didn’t tell anyone about it, but suffered in silence. 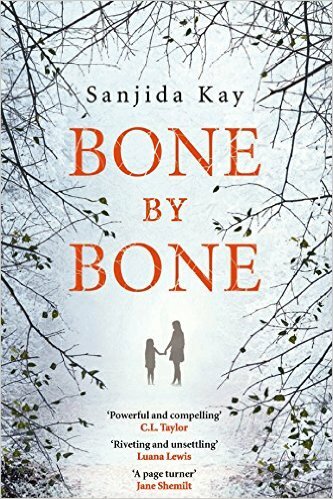 Sanjida is donating a percentage of the profits from Bone by Bone to Kidscape, the anti-bullying charity. A disturbing psychological thriller, here is a writer who knows how to upset a reader's equilibrium. A confident insight into the on and offline consequences of bullying, and the nature of the victim. Sanjida's training as a zoologist (she studied chimpanzees for her PhD) is evident as the narrative evolves into a study of bully and victim. If you enjoy reading on the edge of your seat, you'll enjoy this novel with its twists and turns and things that are never quite as they appear to be. Sanjida Kay is a writer and broadcaster. Bone by Bone is her first thriller. She lives in Bristol with her daughter and husband. Thank you to Sanjida and Corvus for the review copy.